Should your knowledge of Australian art history be somewhat lacking or slow to bloom, a comprehensive introduction awaits at Philip Bacon Galleries. And for those already familiar with the notable names of Australian art over the last century or two, an impressive little assembly of paintings has been drawn from collections across Brisbane and New South Wales from the living rooms of friends of Mr Bacon. The show is a happy opportunity to see many brilliant privately held paintings amongst their peers and in the flesh, in all their brushy glory, squirming from the canvas in a way they never quite can from a page in a book. 40 years, 40 paintings is an utter treat. Perhaps what strikes one immediately on seeing such a spread of Australian works is the oil slick of colours. Lurid colours accost your eyes from all directions, as if steaming on a sizzling bitumen road in full midday sun. Sydney Long’s oil drips and cocktail sticks of flamingos (Flamingo Pool, 1916) greet you as you enter the upstairs gallery, the vibrant pinks bouncing off electric blues—an improbable feat of watercolour. Jeffrey Smart perhaps does them most strikingly, knowing how to set off his acid primaries against neutral yellow-grey skies and dry grass, and a smattering of neutralising rust. 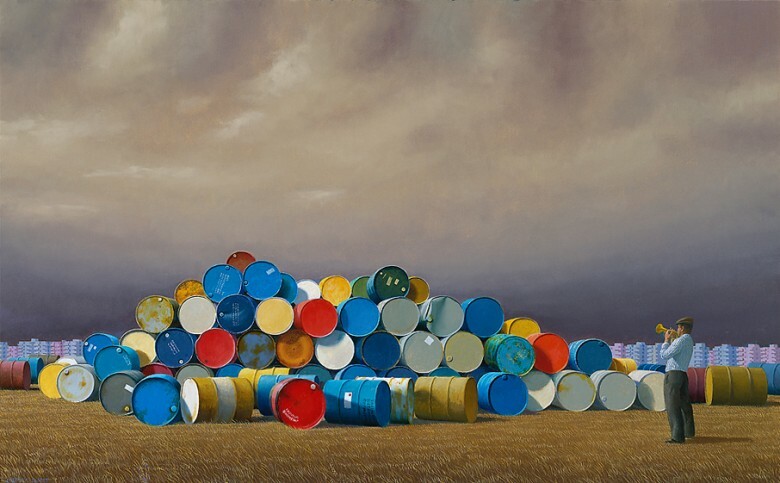 His painting The oil drums (1992) plays on these colour contrasts and the effect is strong and vibrant. Tom Roberts’s A midsummer day (c. 1922-24) puts you squarely on a mountaintop anywhere in Australia, full sun blazing on your audibly crackling skin, a hundred sweating childhood bushwalks and fears of snakes and spiders, the country borderless and endless and hot. Right next to him, Lloyd Rees seeks to outdo his sizzling colours with the near-sickening aqua of his Tasmanian landscape (1974-6). Rees’s heat is unrelenting, not a shadow to hide in, but pure blinding light in a low-contrast image. Other painters seem less carried away by their colours—unafraid to use them, but using them more delicately. Elioth Grüner produces positively glowing landscapes, evoking the harsh sun, or the moody moonlight (Nocturne, 1929), but using this atmospheric colour to lace his images with a romantic feel, a swell of love for the landscape. This nostalgia stands in contrast with Fred Williams’s scruffy trees flecking a sparse and uninviting plane—perhaps mocking the unpicturesqueness of our country, or perhaps affectionately referencing this hardy, unconventional beauty. Ethel Carrick Fox transports us away from Australia entirely, her well-travelled palette comparably restrained as Grüner’s, but her colours burning pearlescent with heat in her purple-white and cream shadows (Mosque at Tangier, c. 1911). Clarice Beckett’s The wet road (1926-7) appeals entirely to subdued colours in a soft tonal medley, clinging to the relief of rainy days. Rupert Bunny captures a surprising softness in his dusky blues, pinks and oranges in Madame Sadayakko as Kesa (c. 1907). Perhaps I have spent too much time of late in European galleries gazing at the balanced browns of old masters, but it seems that our blindingly lit, sunburnt country has seared a high-chroma impression on our retinas, and this has been reflected in our art since our early colonial days. Mosque at Tangier, Ethel Carrick FoxThe usual suspects of token animals, crudeness and humour crop up—comical kangaroo veranda visits, a member of the Kelly gang. A couple of references to Indigenous Australia appear—and to be sure, forty paintings could not canvass the entirety of our history, though it is a solid and admirable starting point for the student of Australian art. Women, though few, contribute a surprisingly strong presence. An interesting chronology is presented through floral still lives, with some by the boys (Sam Fullbrook’s eye-popping Still life, East Brisbane, 1976), but most by the girls. Cressida Campbell situates herself firmly but refreshingly modernly in the long tradition of vase-of-flower paintings carried on by the likes of Margaret Preston (Flowers in a basket, 1933) and Margaret Olley. Campbell’s Orchids and hellebores (2005) holds its own next to Olley’s 1976 Delphiniums and cherries. The latter is a bold and gutsy profusion of deep blues on phthalo greens that slope off, optically mixing, to brick reds, encased by the rigid design of the table and wall, softened by the spray of truculent petals fallen to the table. Campbell’s echoes the design, with stray buds and stems rounding out the globe of flowers, the larger shape mimicked in the ellipse of the water in the vase. Her design is more tight and self-conscious, but proudly so. And the linear touch is a modern evolution of this genre, responding directly to the woodblock medium. Elsewhere, Campbell exhibits her prints, but in this show we come face to face with the textural beauty of the woodblock itself. The lesson wouldn’t be complete without a dash of Dobell, a Robinson cliffhanger, and a Lambert. George W. Lambert’s Jericho during the war (1918) is a meticulously composed leaf of a story, arranged in layers of mountains, trees, tents and creatures. Characters dot the doorways of tents, a flurry of activity amid the desolate desert. Lambert’s draughtsmanship is rivaled by very few in the history of Australian art (keen students might look into fellow war-artist Ivor Hele), and this solid drawing basis is clear as a bell in his paintings. The tangled, topsy-turvy William Robinson (Passage of light from the sea at Numinbah, 2002) must also be seen in person for a sheer sense of its grandeur and for the true effect of rolling through the landscape—Robinson pulls your eyes through dense thickets, down cliffs and up to disorientingly ‘down under’ night skies. William Dobell’s exquisite Boy in Jodhpurs (1953) is a pure delight in the flesh—paint blooming and cracked, menacing greens glazed until they look so deep you feel you might fall in the picture. The boy’s narrowed face continues the effect of his jacket, which is exaggeratedly pinched at the waist above his bloated belly—his bulging eyes and sloped shoulders taunting. This painting is full of life and mischief. Bacon’s show is a fitting celebration of his forty years on the fringe of New Farm. In a time when even distinguished galleries in Sydney are closing, it is no mean feat to maintain such a respected gallery for such a significant period. 40 years, 40 paintings is showing until 15 March 2014, 10am to 5pm Tuesdays to Saturdays, and you’d do well to take advantage of it. And should you need to debrief, and expand your knowledge of Australian art, Nick Leavey will be most obliged. Drop by his classes on Wednesdays, 9.30am to 4pm, or Thursdays 6.30pm to 9.30pm, or during the portrait session on Fridays 9.30am to midday. While there are no official art history courses at the Atelier, we offer endless informal discussions over books and loose-leaf tea with a history-loving, library-toting painter.